I can not even tell you how often my kids ask me to make granola. They love the stuff, and I have to say, it makes me both happy and proud as a mom to see them picking on a bowl of granola as an afternoon snack. This Honey Almond Flax Granola is my latest granola creation and the kids and I went through it quickly over the weekend. February is Heart Health month and I am happy to have partnered up with Fisher Nuts once again to bring you this heart healthy breakfast or snack recipe your whole family will love. My children’s heart health (and health is general) is obviously a priority to me so I know that the more I teach them to take care of their hearts and bodies at a young age – by nourishing themselves with good food and staying active – the better the chances are of them having healthy lifestyles as adults. What more can you ask for really? I do believe that it really is up to us as parents to set a good example and guide them. Did you know? Fisher has 9 nut products certified by the American Heart Association (AHA) as heart healthy. 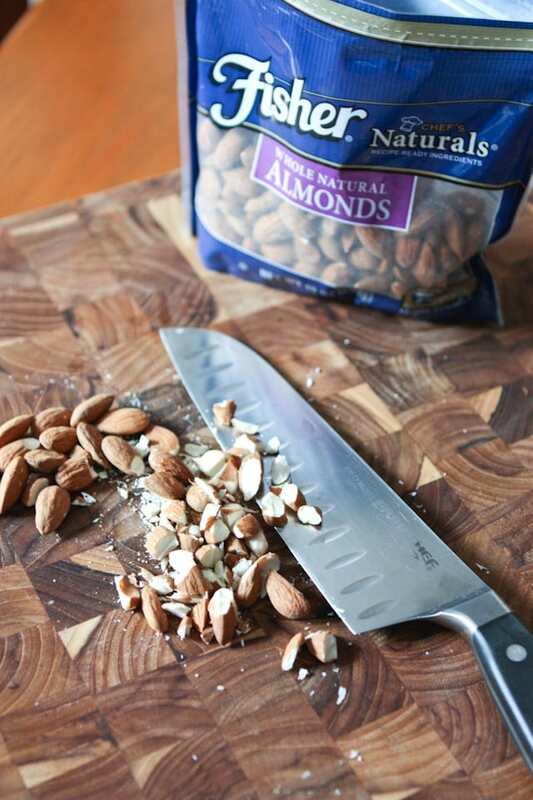 Fisher Nuts are preservative free and good for you! This Honey Almond Flax Granola recipe is chock full of good stuff – oats, almonds, flax, and chia seeds combined with honey and coconut oil. Simple ingredients, and so easy to make. That’s definitely a good thing because a jar of granola does not last very long in my house, that’s for sure. Combine all ingredients in large mixing bowl. Gently stir until all ingredients are thoroughly combined. Pour onto baking sheet and spread out evenly. 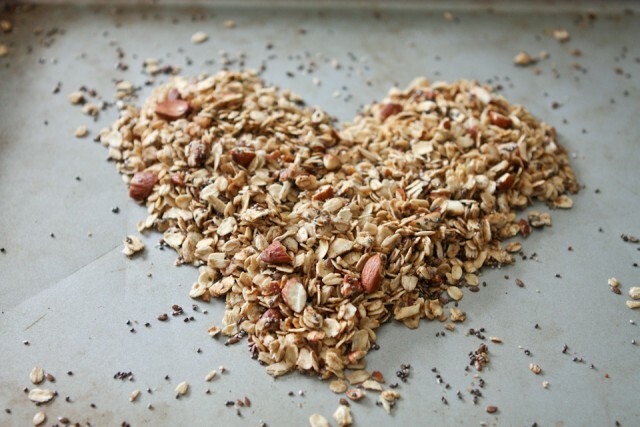 Bake for 20-25 minutes (gently stirring about halfway through cook time) until granola is fragrant and golden brown. Let cool. Store in airtight container. Serve as a snack as is or sprinkled over yogurt and fruit. This post is in partnership with Fisher Nuts, however all opinions are my own. I JUST (like this week) started buying flax to sneakily add to the hubbies breakfasts, because it’s SO GOOD FOR YOU. And then you posted this, and he just so happens to be obsessed with granola. PERFECT. Pinned! I love all those ingredients and I usually end up using granola as a snack. 🙂 Pinned! So yum! I make granola every other week for my Dad and us! Homemade is best!!! I’m going to try your mix next time. BTW- made the taco bowls this week and we all loved them! Kaylin even ate the mix !! Aggie, love granola and almonds are my favorite nut! Will make this to take to FBF2015 this weekend, the girls will love to have something to snack on in between the meals. Thanks for the recipe! Hope to see you there & catch up! We still have to meet at Peach Valley one day. Homemade granola is THE BEST! Love your recipe! I’m mad for nuts and granola and love how healthy this is! Being gluten-free I could easily adapt with gluten-free oats to make this at home. I could eat granola for 3 meals a day! Fisher nuts are my favorite. And I love that this is sweetened with honey! 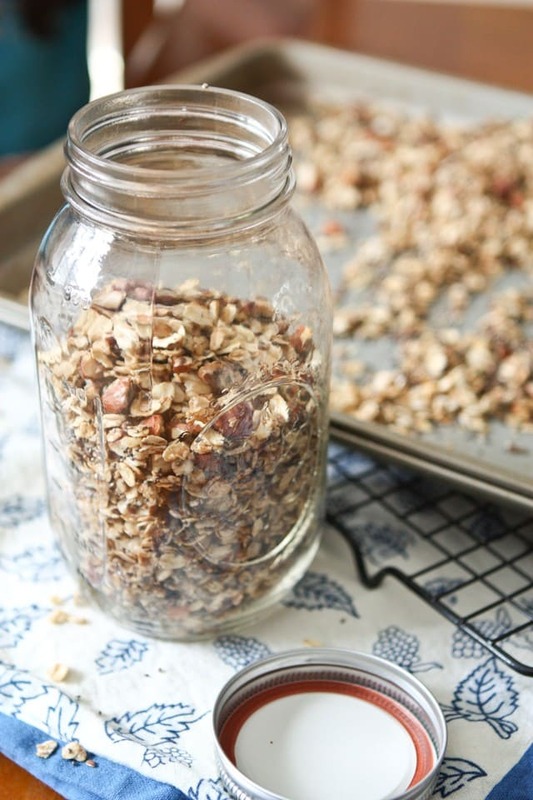 I make a similar granola literally once a week — we can’t get enough of the stuff! Yours looks fantastic – love the honey with the almonds. My first time making granola. I could not wait to wake up this morning to eat it in my yogurt. Delicious! 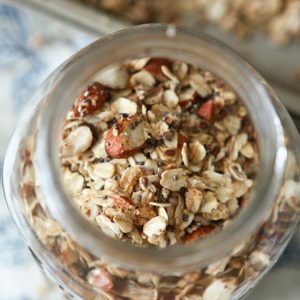 I’ve made granola before and love how easy it is. Had to try yours and it’s so good! Made it just in time for FBF2015 and took it to the hotel & parks with us, the girls couldn’t get enough of it. Making it again, thanks Aggie for the recipe. 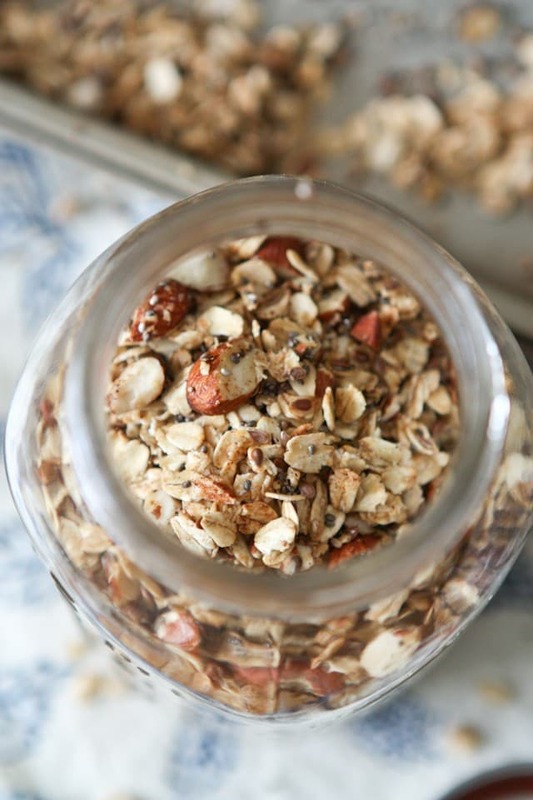 I have made several homemade granola recipes before, but this is the BEST! Love that it has flax and chia too. I know I will be making this over and over again. Thanks. Thank you so much for letting me know Maria!! It makes me really happy to know you enjoyed it so much.